Hey! I made a super simple appetizer that will trick all your friends into thinking you’re a gourmet chef – seriously. I’m sharing the recipe here and over at Iowa Girl Eats this week! Check out Kristin’s post for the full story behind the recipe and lots more photos. Plus, I share a bit about how Minimalist Baker came to be, so if you’re new to our site venture over to get to know us better. We’d love that. This recipe falls in the minimalist category for its 10-item ingredient list and 30-minute preparation time. 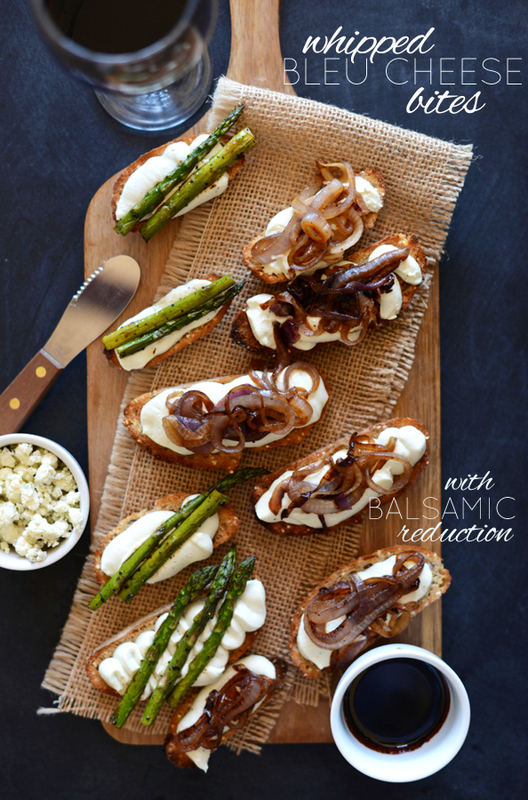 Super simple, super delicious, super perfect for springtime patio parties. Enjoy! 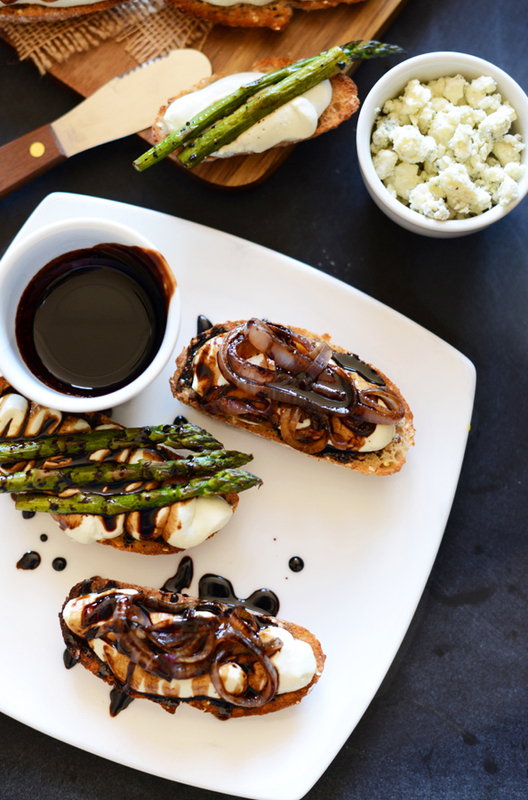 The perfect simple-yet-fancy appetizer: Creamy whipped bleu cheese dip atop toasted baguette with caramelized onions and asparagus and a savory balsamic reduction. Preheat oven to low broil and position rack on second from top position. Slice baguette into 1/2 inch pieces and arrange on baking sheet. Plan for 1-2 per person. Set aside. Prepare bleu cheese dip by placing bleu cheese, cream cheese, vinegar, olive oil, and pepper in a food processor and mixing until well combined. Drizzle in milk 1 Tbsp at a time while mixing until desired consistency is achieved. It should be thick like frosting. Scoop into a large plastic bag and set aside. Sauté asparagus and/or red onion in a large saucepan over medium heat until tender. Season with salt and black pepper. To properly caramelize the onions, make sure to keep the lid on to lock in moisture and get them really soft. Set aside. 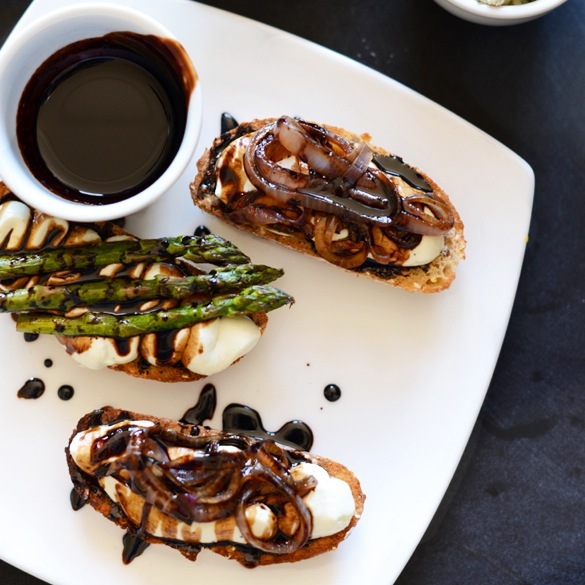 Prepare balsamic reduction by placing balsamic vinegar in a small saucepan over medium heat, stirring occasionally and being careful not to boil. Cook for about 10 minutes or until the liquid has reduced by about half and a wooden spoon scraped across the bottom leaves a visible line – it should appear somewhat “syrupy.” Pour into a small ramekin for serving. Pop baguette in the oven and watch closely, toasting until light golden brown. Then remove from the oven, pipe on whipped bleu cheese, and top with sautéed asparagus and/or caramelized onion. 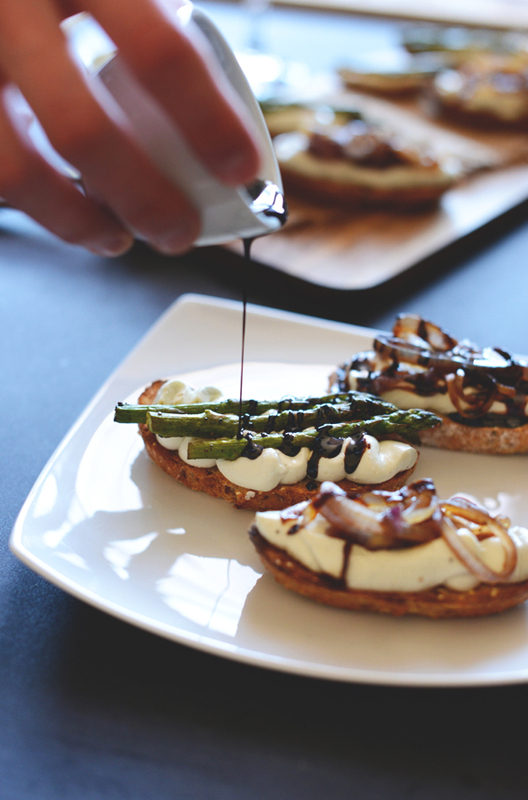 Drizzle with balsamic reduction and serve immediately. *You can use asparagus and/or red onion. I just made this for my friends and I and it was delicious. Such a good recipe for a relatively quick lunch snack! This looks A-mazing! I love whipped cheeses! Can’t wait to try this. Super and simple – that’s what I need! Love that balsamic drizzle too! this looks so tasty…and simple! my friends and I have already planned a day in the summer, when we’re all back home to make a feast and these are already on the menu! Oh Dana, I was so excited to see these come up (twice) in my reader! I’m always looking for unique little bites like these. I’ll definitely be making these in the next couple weeks. It’s prime Thai holiday season, and there’s lots of entertaining to be done! I love blue cheese and this looks amazing! What a great quick and easy appetizer. This looks tasty, as it always does when i visit You. I saw this recipe on Pinterest, then IGE, then here and each time I’ve drooled more and more. Not a pretty sight, but… these definitely look amazing! So pumped to make these! I just made whipped blue cheese! I got the idea from How sweet eats when she posted her whipped feat cheese. These toast the so gosh darn good!!!! I can not wait to make these!